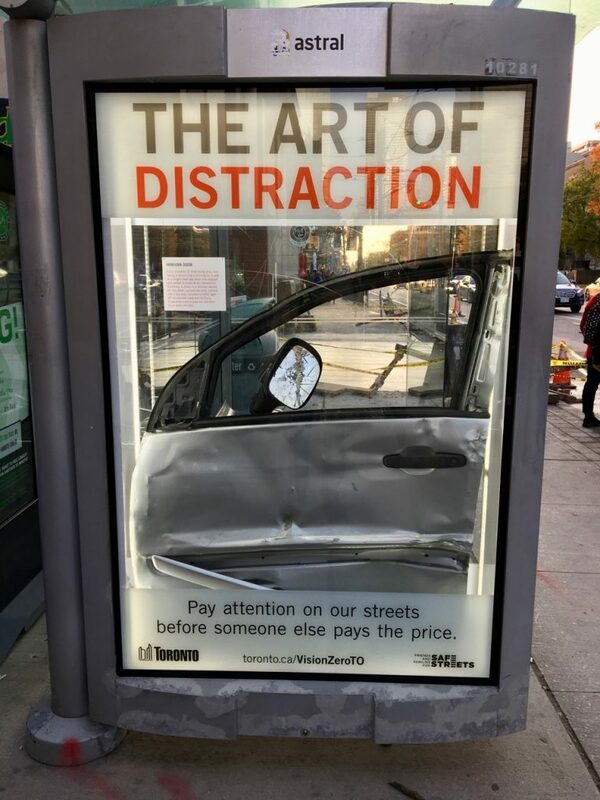 The Art of Distraction is a multi media campaign launched by the City of Toronto to remind drivers of the potentially fatal consequences of not paying attention while behind the wheel. 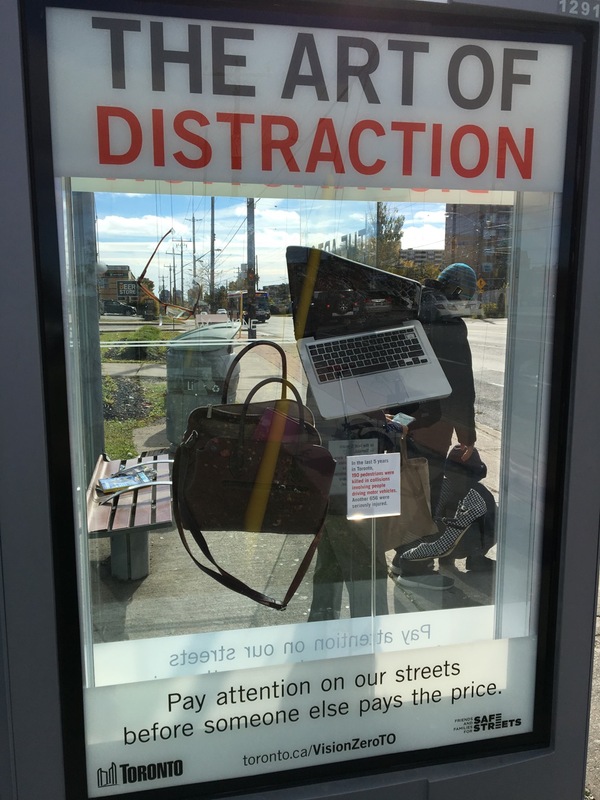 Among the more visible parts of the campaign are five striking advertisements on bus shelters, with four downtown and one in East York. Each of these shows smashed items along with a back story. What makes some of them particularly powerful is that they use some of the actual items involved in a fatality. 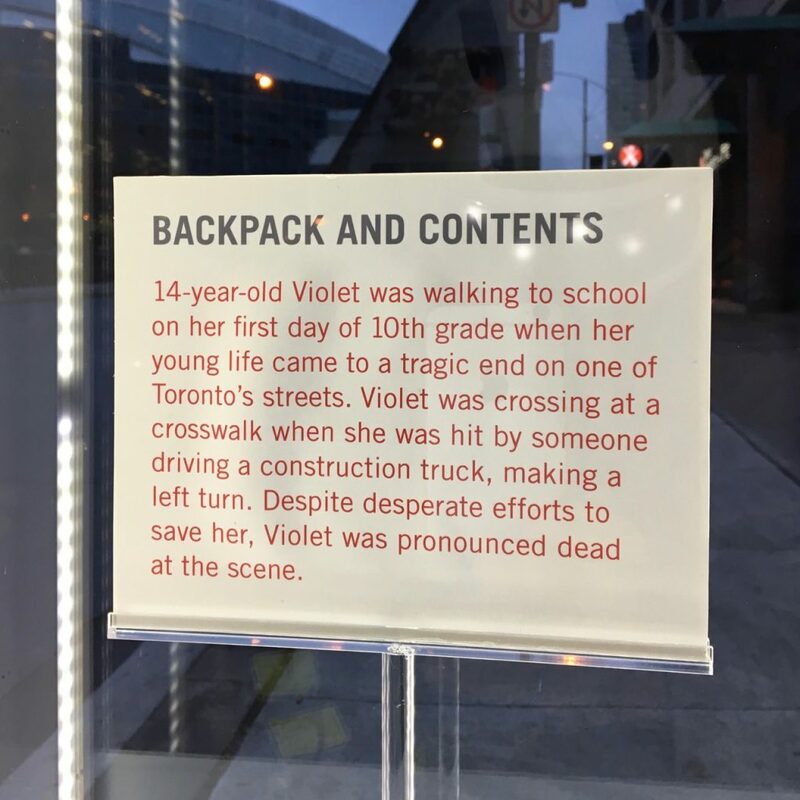 This campaign is co-sponsored by Friends and Families for Safe Streets (FFSS), an organization that was founded by the relatives and friends of several road victims. Here are some of the stories behind each of these five. King and Spadina: Edouard Le Blanc. Edouard Le Blanc was killed at the age of 63 in October 2014. He was biking on the Gatineau corridor multi-use trail and was crossing Warden Ave at the signalized intersection when a car ran the red light and hit him. The driver was convicted of careless driving and fined $700. 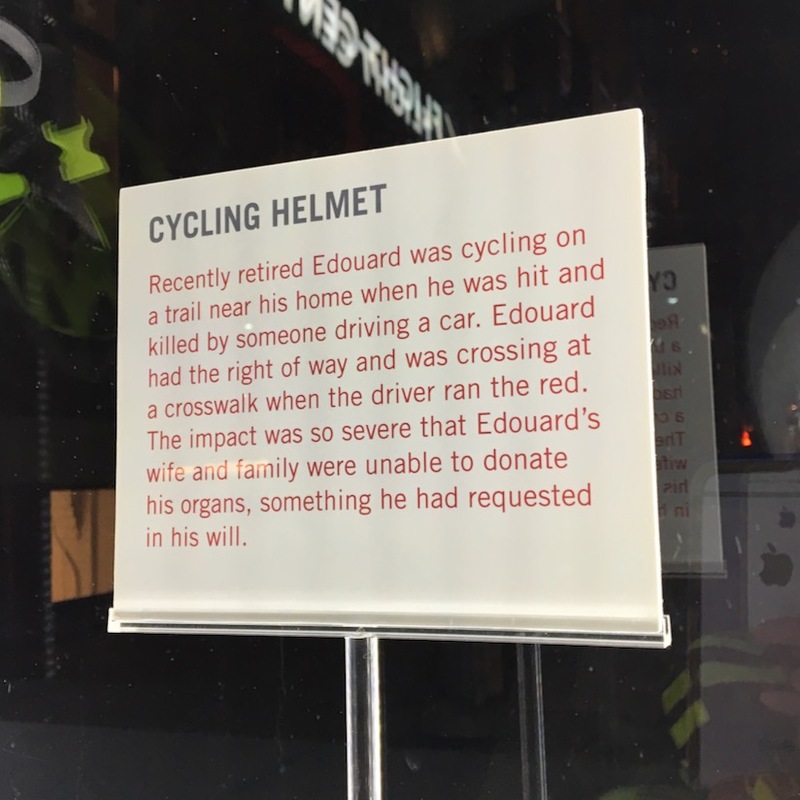 The display shows Edouard's helmet. 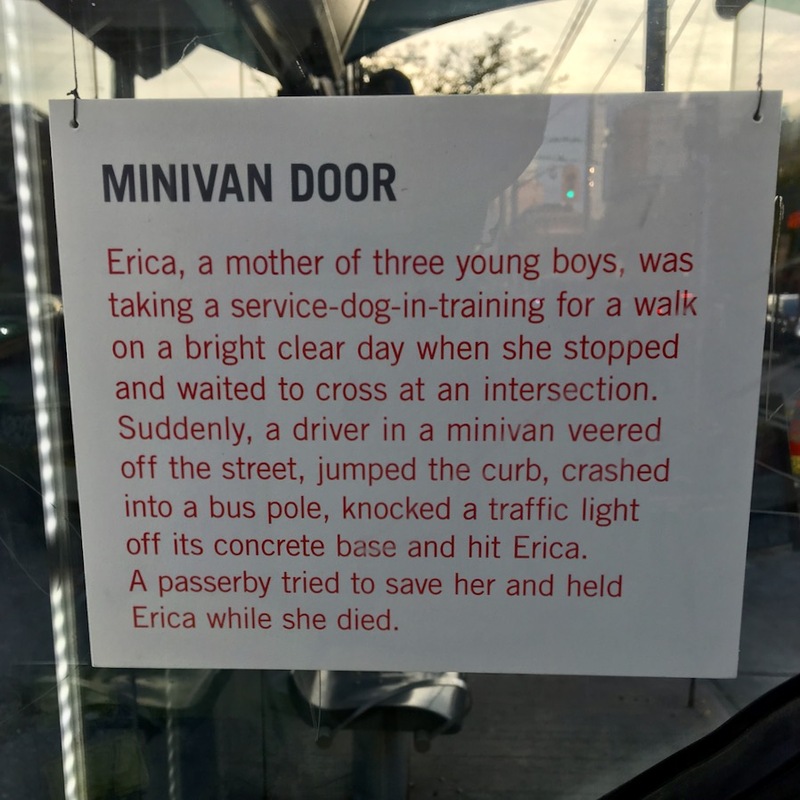 Erica Stark was walking a dog when a minivan jumped the curb and hit her, killing her. The driver was convicted of careless driving and fined $1,000, with one month driving suspension and five months of further driving restrictions. 14-year-old Violet Liang was killed by a dump truck while heading to the first day of school. The driver was charged with careless driving and failing to yield to a pedestrian. 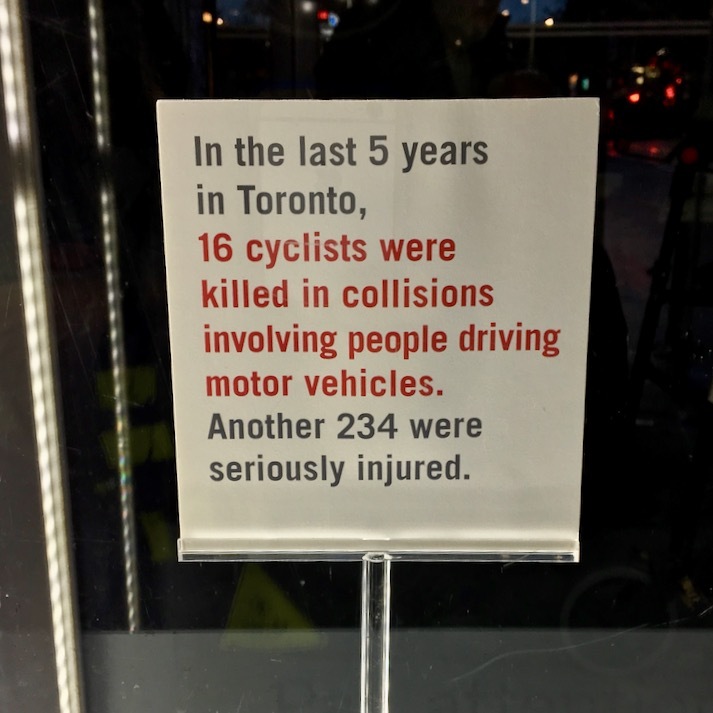 This exhibit draws attention to the high number of cyclists killed or injured by motorists in the past five years. This exhibit draws attention to the very large number of pedestrians killed or injured by motorists in the past five years. The city’s website for the campaign features six more specific cases, such as Gary Sim who died last July, Tom Samson who was killed six years ago, and Jessica Spieker who was severely injured and lives with the effects of those injuries to this day. The campaign also includes TV ads on CP24, as well as social media and radio. Print ads including all of the cases on the city’s website will be posted on an additional 300 bus shelters. This campaign is co-sponsored by Friends and Families for Safe Streets (FFSS), an organization that was founded by the relatives and friends of several road victims. 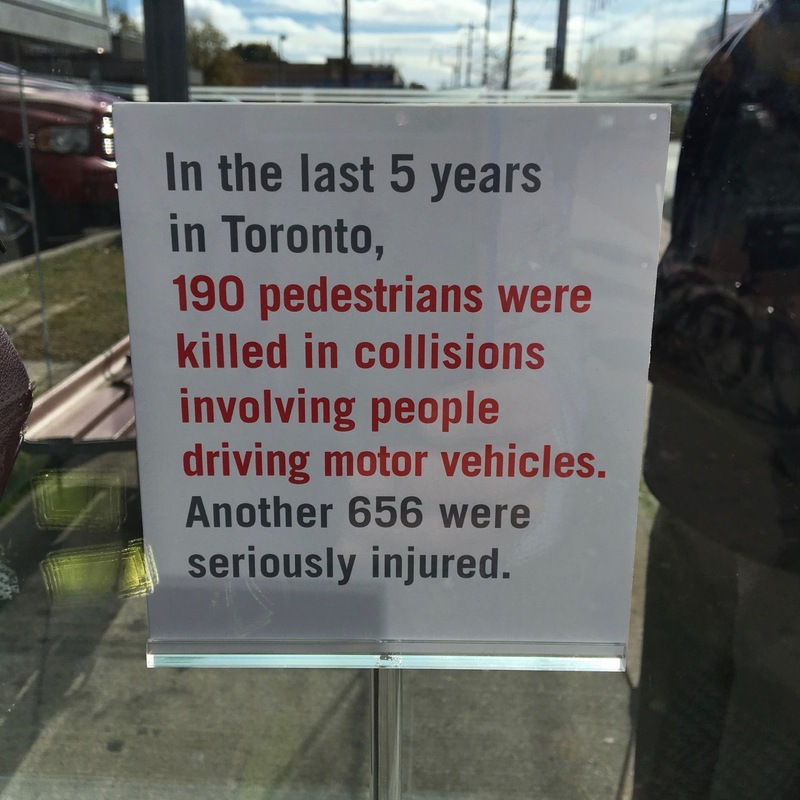 Through their lobbying there have been some changes in how the fatalities of pedestrians and cyclists are reported. The media is now careful to avoid the use of the word “accident” which in this context absolves the driver of responsibility for a fatality. 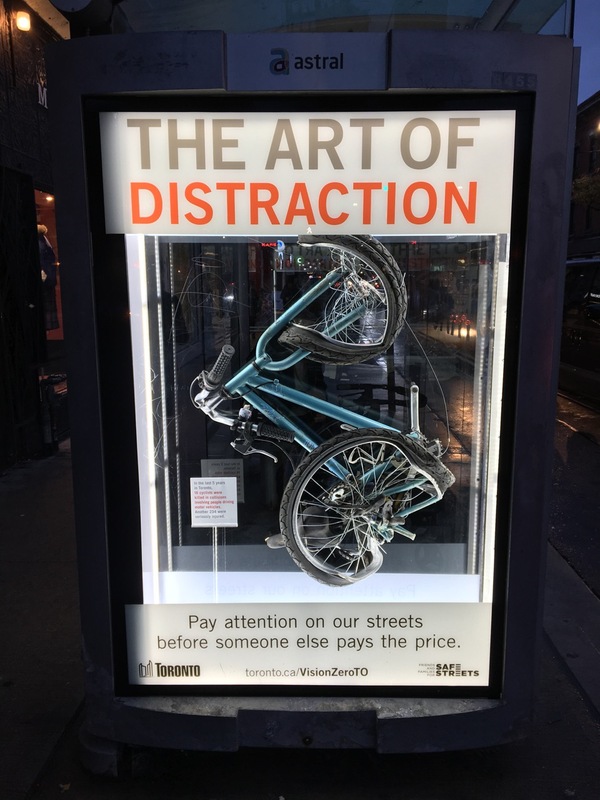 There is still more to be done since media stories inevitably report that a cyclist killed was not wearing a helmet, or that a pedestrian was wearing dark clothing. 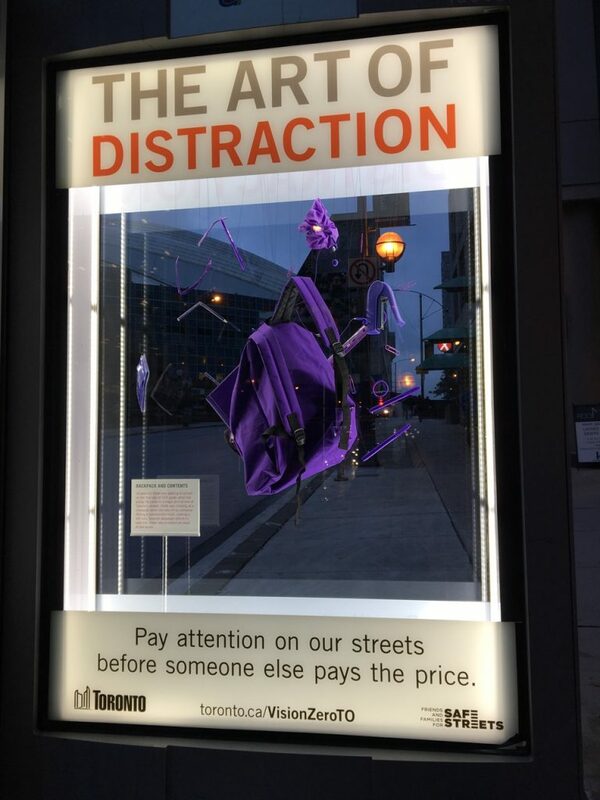 This reinforcements a public tendency towards victim blaming, even though a city safety study shows that the driver is to blame about two thirds of the time. According to Patrick Brown, principal partner at law firm McLeish Orlando, this culture of victim blaming also appears in the courtroom, with drivers often able to plead down to minimum sentences. In the case of Edouard Le Blanc, court filings show that the defense tried to argue that Mr. Le Blanc was not wearing a bike helmet when he was hit, even though that was untrue and the driver was completely at fault. It is his actual yellow bike helmet that is displayed at King and Spadina. Patrick and others have been working to promote Vulnerable Road User (VRU) legislation at the provincial level. This VRU does not argue for increased penalties in the form of fines or jail time. What it does aim to do is to impose meaningful penalties for a driver convicted in a case resulting in death or severe injury to any vulnerable road user, such as a pedestrian, cyclist, construction worker, emergency responder, etc. Road deaths and injuries will only stop when safer infrastructure for all road users is built. This takes political will, and will also require a fundamental culture shift away from an auto-centric view of transportation. 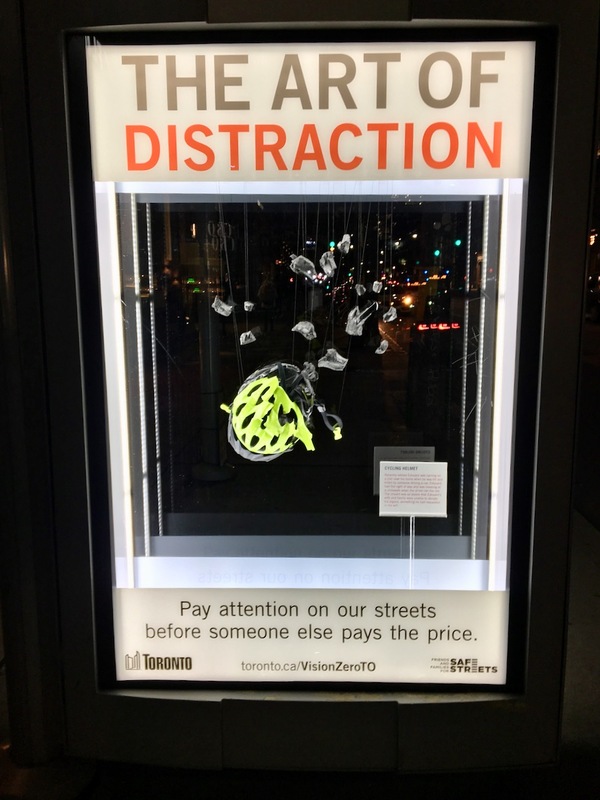 According to Kasia Briegmann-Samson, one of the co-founders of FFSS, the Art of Distraction campaign is part of an education program to bring about that shift. "I'll never forget the moment I was handed that paper bag containing Tom's personal items. It was cruel and unceremonious, although I realize it must have also been extremely difficult for the police officers whose job it was to return these items to families,” says Briegmann-Samson. “ The Art of Distraction attempts to show this excruciating reality of road violence. " Listen to her on Metro Morning. Friends and Families of Safe Streets is holding their second annual candlelight vigil for victims of road violence on Sunday, November 18 at 4 p.m. We will meet at David Pecault Square and walk down to the waterfront at the Music Garden. Fines for distracted driving in Ontario will go up in the new year.